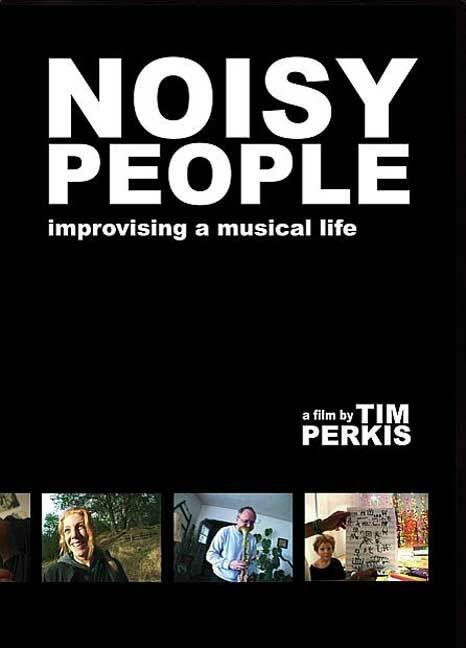 NOISY PEOPLE: Improvising a Musical Life – A Film by Tim Perkis (DVD) Featuring: George Cremaschi, Tom Djll, Greg Goodman, Phillip Greenlief, Cheryl Leonard, Dan Plonsey, Gino Robair, Damon Smith; also Kenneth Atchley, Laetitia Sonami. Tim takes his camera and gets up close and personal. He follows each artist into their world. The age-old question of how one fashions a creative life is answered not only through the musicians’ words but in the way they choose to live their lives. The musicians profiled are, interestingly, neither professionals – in the sense of making a living from playing music; nor amateurs – in the sense that they are only just learning to play their instruments, or playing music as a sideline. 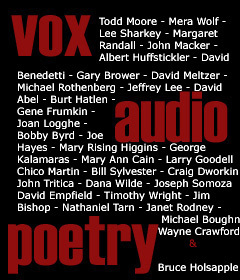 Indeed, several of the players – Robair, Plonsey, Djll, Leonard, Greenlief; as well as Atchley & Sonami (whose portraits are included in two separate short films on the Noisy People DVD) – have undergone professional music training, but have used it as a stepping stone to their own craft and creativity rather than as a tool to build careers with. Some tried taking jobs as professional musicians, but couldn’t stand it. Saxophonist and composer Phillip Greenlief relates how he took a job for a time – making $600 to $700 a day – formulating music for an exercise video. He says “I hated the music!” And he tells us that all the people he knew who were professional musicians “hated music,” that the last thing any of them wanted to talk about in any meaningful way at the end of the day was music. Other players speak of the music in more political terms. Staunchly outspoken bassist Damon Smith quotes legendary bassist Red Mitchell as saying that all improvisation is a political negotiation, that one cannot be too “selfish” or too “groupish” in playing but must find a balance between the two. 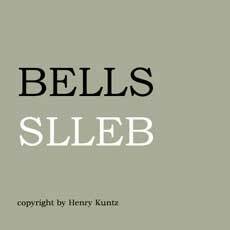 Tom Djll’s orchestral music reflects his belief that it is the process of music and not its structure that is politically important; his orchestra is made up of pre-existing groups who may independently shape and set the music’s course as it is played. What these players’ music reflects is the type of democratically and consensually governed society they (and we) would like to live in. While none of the players’ music is well known by big media, the inherently communal aspect of playing it and presenting it is fundamental to the musicians’ own appraisal of its cultural importance. You quickly glimpse that communal feeling when you see Tom Djll’s orchestra performing his ‘Mockracy, or see Gino Robair’s 40-piece ensemble playing and improvising his “opera in real time,” I, Norton. Although not featured in Noisy People, equally important to the Bay Area community has been Moe Staiano’s Moe!kestra. 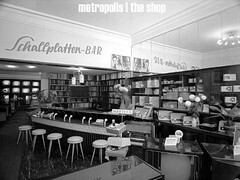 Moe!’s gargantuan orchestral events have amounted to amazingly cohesive urban rituals that work, like the film’s highlighted gatherings, to cement ties between musicians who might otherwise never play together, and between them and the community they live in. Dan Plonsey, in speaking of the aesthetic bent of his own occasional large ensemble, the singularly tuned Daniel Popsicle, relates that for him creating music is “more to encourage other people to create than it is about making things to listen to.” That, I would imagine, is as about as community oriented as one could get; to continually expand the grand circle of creativity until we are all finally standing in it together. There is also a strong exploratory and experimental bent to each of the players’ work. For some, that starts right at the level of instrumentation. We see Tom Djll, for example, reinventing his trumpet to simulate electronic feedback; Gino Robair deconstructing and reconstructing everything he has ever learned about percussion; and Cheryl Leonard approaching the organic materials (like pine cones) she uses as “instruments” with the detached demeanor of an occult scientist. Laetitia Sonami, in one of the separate short films that accompany Noisy People, relates how, out of an innate sense of curiosity, she is constantly reformulating everything. For her, it is working with a self-created black Lycra lady’s glove embedded with sensors that connect to a computer that generates sounds; the glove allows her a modicum of physical relation to the sounds she is making (approaching dance) rather than simply working motionless at a keyboard. Her goal is to use sound to create what she refers to as an “anti-space” that the audience may fill according to their own wishes and possibilities. But one person’s “anti-space” is another’s physical space. That would be Greg Goodman’s (“Woody Woodman’s”) Finger Palace, the Bay Area’s longest running (since 1978) presenter of avant-garde music and theatre, where $25 might get you a banana for a “ticket” and a “something-close-to-tinker-bell” down-the-rabbit-hole experience. You might also catch the brilliant Goodman playing “unprepared” piano! Noisy People, as well as being the “love letter to the Bay Area music community” that Tim Perkis envisioned, is an uplifting tribute to musicians and sound artists everywhere who are intently exploring the edges of sonic reality. Also available are DVD copies of the film, a CD of music and sound clips from the film, digital images and an essay on the filmmaker here… or just click below on the Noisy People banner. George Cremaschi was born in New York City, and studied jazz at Jazzmobile in Harlem, composition at Greenwich House Music School in Greenwich Village, and improvisation at countless Downtown dives. Recent years have seen many performances and collaborations in the US and Europe with such renowned musicians as Evan Parker, Marshall Allen, Andrea Parkins, Gert-Jan Prins, Mats Gustafsson, Paul Lovens, Nels Cline and Saadet Türköz among others. As a composer, he has written nearly 100 pieces for chamber groups, small ensembles, solo contrabass, electronics, cinema, spoken word, dance and theater. He divides his time between Oakland and Tábor, Czech Republic, where he is an artist in residence, curator and administrator at Cesta, an international arts and cultural residency center. Made by an insider in this scene of outsiders, Noisy People beautifully captures one of the most vibrant and unusual music communities in America. Through his series of affectionate portraits, Tim Perkis illuminates the glimmers and glitches of true invention. This film belongs in the canon of brilliant movies about artistic innovation. Funny, profound, and deeply inspiring.– author of Everybody Into the Pool, Beth Lisick. It’s hard to find a more daring and tenacious experimental music scene than the one emanating from the Bay Area. Nowhere, not even New York, are the musicians, composers, and technologists more committed to confounding our expectations…. From Phillip Greenlief’s challenge to encounter composition differently, to Cheryl Leonard’s search for sounds in nature; from Dan Plonsey’s desire to find the musical not in every sound, but in every person, to Gino Robair’s instruction to “play nothing, but intensely”: these artists are in a constant state of revelation, coaxing supple sounds from an expanded sense of the sensorium…. –Pacific Film Archive, Steve Seid. [A] vivid portrayal of the San Francisco Bay Area’s improvised music scene. The movie delivers its message through interviews, concert performances, revealing footage of the musicians’ living spaces and backyards and evocative shots of less-than-fashionable Bay Area neighborhoods…. The appearances of certain high-profile musicians, including saxophonist Anthony Braxton and guitarist Fred Frith, indicate how the local improv scene’s borders blur both geographically and artistically…. The Bay Area improv scene may be a serially homeless and occasionally ephemeral entity, but thanks to Perkis, it now has a good, permanent, slice-of-life document of its quirky creativity…. 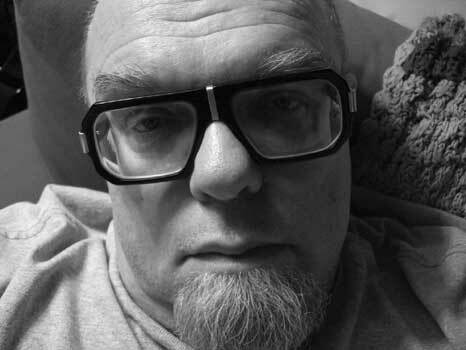 Noisy People nails a niche that, as Down Beat used to say, deserves wider attention.–SF Gate, Derk Richardson. What a trip! …a curiously refreshing musical tour through one of the East Bay’s least understood (but hella deep) pools of creativity.–East Bay Express, Oakland, Kelly Vance.